Starting a new activity is exciting. Despite the learning curve, a new adventure in one’s life solidifies lasting memories. Confronting new challenges definitely adds character and laughable moments, especially for kids. New adventures for toddlers and kids occur daily and as they get older, new adventures await them every day. This is why skiing is a great way to keep kids entertained, challenge their comfort zone, and at a minimum, expend some energy. Rent Gear – no need to spend a lot of money to see if your kid ‘likes’ to ski. There are many places that rent equipment and if your options are limited, the local ski hill always has a rental center. Borrow – if renting is not a suitable option, don’t be afraid to ask around to borrow some stuff for a weekend. This includes some clothes as well, mostly outerwear. No one likes to lend out, or borrow for this matter, any base layers. Practice at Home – If you have equipment available, put it on your kid and practice on carpet or outside (on soft ground, such as grass). Ski equipment is awkward and heavy. There’s nothing “natural” about having heavy boots and skis on your feet. When you have everything on, do some basic exercises such as walking in a straight line, picking up one foot and holding it up, and last, taking small side steps. 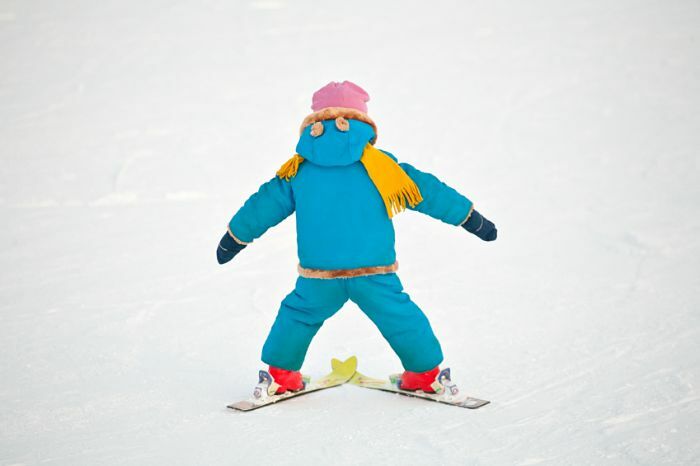 These exercises are all taught at ski resorts for the little ones. Go Light – if you are hesitant on your kid liking all of the heavy gear, there are plenty of light gear you can try. Many options exist for plastic cross country skis for kids. These are skis that usually strap your kid’s snow boot in, to go cross country skiing. Get a pair of these skis, which are usually cheaper, and practice around the yard (see # 3). If you have extra snow boots you can spare, screw them into the plastic binding for a more secure fit. Find a Small Hill – no need to pay the hefty ski resort pass fee. Find a local area with a small hill, and walk up. We’re talking about a short hill without much gradient. This is a cost effective way to get some practice. Check the Weather – no need to introduce skiing in a blizzard. Pick a nice(r) day and go for it. Bring Hot Chocolate – have fun. Make fun associations to skiing such as bringing hot chocolate and sipping on it at the end. Set up for Success – introduce skiing in small doses. Practice for 15 minutes and then just play in the snow. Continue to ramp up the time spent on skis throughout the year. There’s no need to turn anyone into an expert skier in one year. Take your time and have fun! As with any new adventure, there is a learning curve. Practice patience, gradual persistence and never forget to have fun. If you get to a point where teaching your kid is challenging, try enrolling them into a short ski lesson at the local resort. Having taught kids in the past, there are many techniques that have been used to successfully teach new kids (or adults) skiing. Having fun is the priority!